The Big Fun Guide to Tar Heel Country: 135+ Activities for Families in Chapel Hill, Carrboro, Hillsborough, Pittsboro, and Points in Between! 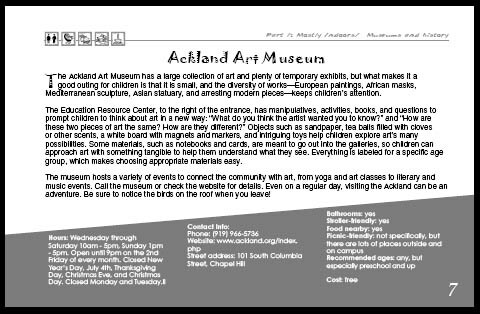 A comprehensive guide to family activities in Chapel Hill, Carrboro, Hillsborough, and Pittsboro, North Carolina. From parks to playgrounds to animals to hiking, The Big Fun Guide provides over 135 activities for families of young children in Orange and Chatham Counties, NC, as well as 20+ day trips within an hour’s drive. through Baker & Taylor, Follett, and Brodart for bookstores and libraries. I laughed, I cried, I found the potty!… Truly a most valuable resource; my kids and I will never be bored again! Erin has listed the great attractions we knew about, but she has also discovered some quirky and adventurous activities we never dreamed existed in our area. I also appreciated the parent perspective – information on food, strollers, and potties – which is information much more helpful to have before a crisis strikes. Forget receiving blankets and teddy bears, from now on my standard baby shower gift will be The Big Fun Guide to Tar Heel Country! 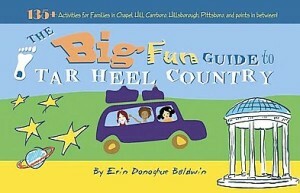 The Big Fun Guide is an excellent incredibly comprehensive guide to all things fun and interesting for Tar Heel Country families with children! Inentertaining and easy prose, Erin organizes and shares critical information that is quickly accessed, faster than even the internet. Everyone should have two copies – one for home and the extra to keep in the car! Then you'll be excited about Easy to Love but Hard to Raise: Real Parents, Challenging Kids, True Stories. It'sa collection of essays by people parenting children who are easy to love, but hard to raise. It also has its own blog + Facebook group - join the discussion!